In Buckley’s Middle School (Class IV, Class V, and Class VI), boys are provided with stimulating experiences in academics, arts, and athletics. As students progress through Middle School, they are given an increasingly rigorous and advanced academic curriculum as well as more choices in athletics. For the first time in their Buckley career, on four report cards per year, boys receive achievement letter grades (A+, A, A-, B+, B-, etc.) along with effort marks, the top two being “excellent” and “good.” At the end of the First and Second Semester, the Effort Honor Roll is posted outside the Headmaster’s office. Middle School students take five major academic courses: science, English, mathematics, history, and French or Spanish. Some Class V and Class VI boys who need extra help with their reading and writing skills take Skills and Language Arts, instead of Spanish or French. In Classes IV and V, the homeroom teacher is the instructor in English, math, and history. In Class VI, classes are departmentalized, and the homeroom teacher teaches Class VI boys mathematics or English. Twice a week, two mathematics teachers work with smaller groups within a Middle School homeroom. On Friday afternoons and at other times, boys are able to see their teachers for individualized and group extra help from teachers. As students progress through Middle School, with guidance from their teachers, they produce longer and more sophisticated written compositions for their English, history, and science classes. Each boy is issued a Chromebook, which they keep in school and use for many projects, including writing, conducting online research, and creating visual presentations. During the winter term, boys have bi-weekly classes in Social and Emotional Learning as well as Diversity and Inclusion. In these teacher-led discussions, they have an opportunity to explore topics such as kindness; honesty; courage; teamwork; ethnic and socioeconomic diversity, and social inclusiveness. Students who desire a position of leadership within their homeroom may run for the offices of Chairman, Secretary, Treasurer, Class Librarian, or Buckley Athletic Association Representative. A variety of activities in drama, music, art, crafts (woodworking), and public speaking allow Middle School boys to express and develop their creativity and talents. At the Spring Exhibition, a work that each student has produced in art or crafts classes is displayed in the Walsh Building or the Arts & Sciences Building. In addition to their regular academic music classes, all boys are members of the Middle School Glee Club (one for Class IV and another for Classes V and VI) and sing publicly at concerts before the Buckley community. Students also may volunteer to play instrumental pieces in music assemblies. Middle School boys participate in annual dramatic productions, which are viewed in the auditorium by parents, faculty, and fellow students. As part of the English curriculum, boys regularly recite poems they have memorized, and some students from each homeroom deliver poetry recitations during the annual Oral English Assembly. Boys get many opportunities to practice public speaking, which has always been an important part of a Buckley education. All Middle School students participate in afternoon athletics, along with a bi-weekly indoor physical-education class on Friday morning. Middle School boys choose their sports from the offerings of soccer, football, wrestling, gymnastics, strength training, lacrosse, and baseball. Class VI boys can serve as captains of their teams. The athletic coaches stress sportsmanship, determination, respect for opponents, and cooperation, along with the development of their athletic skills, strength, and conditioning. Following afternoon athletics, boys may return to school for our Boomerang program, which provides a variety of small classes, including chess, Lego robotics, Minecraft, and study skills/study hall. Blair Scribner is the Director of the Middle School, a Class VI English and homeroom teacher, and a graduate of the Class of 1968 at Buckley! He has undergraduate and graduate degrees from the University of Pennsylvania and has been teaching at Buckley since 1981. Prior to becoming the Director of the Middle School, he taught English and homeroom in Class VII and served as Associate Director of the Upper School. Having spent almost 45 years of his life at the School, Mr. Scribner is a bit of a Buckley legend! Every year, Class IV does an extensive exploration of Greek mythology that culminates in a Greek Wax Museum. To prepare, each boy begins by choosing a mythological character he would like to research more deeply and becomes an expert on his character’s traits, the special symbols and objects associated with them, and the stories that are told about them. He crafts a concise explanation of his character’s identity to share with museum visitors and selects one story to retell to those who would like to hear more. 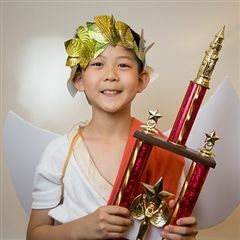 On the day of the Greek Wax Museum, each boy dresses in full costume as his character and becomes a living exhibit, sharing his expertise with visitors through first-person role play. For more than two hours, the classroom “galleries” are packed with parents, special guests, students from every grade level, faculty, and staff.